INDORE: At a time when the country's automobile industry is passing through recessionary phase, Bajaj group's flagship company and automobile major, Bajaj Auto is looking for investment in Madhya Pradesh. Having an annual turnover at Rs 12,000 crore, Bajaj Auto, has expansion plans and is exploring possibilities of investment in the state. While interacting with members of Indore Management Association (IMA) here on Wednesday, managing director of Bajaj Auto, Rajiv Bajaj, expressed his willing to investment in MP. Bajaj was in Indore on Wednesday to attend an interaction programme, which was held by IMA. The world's fourth largest two and three-wheeler manufacturer had explored the possibility of investing in Gujarat in past. Bajaj sought details about facilities being provided by the state government for investors here and how they were different from those being provided in other states. Bajaj said that if he was convinced that the facilities in the state were better, he can think of making the investment in the state. President of IMA, Shamit Dave said, "Bajaj told us during a closed-door interaction that he was interested in having a manufacturing facility for two-wheelers and auto rickshaws in Madhya Pradesh. He has asked us to talk to the Indore's development commissioner (DC), Sanjay Dube, in this regard. We will be meeting the DC shortly and ask him to contact Bajaj for the same." Pithampur industrial area, located 35 km from Indore, has presence of automobile firms like VECV, M&M and Force. Bajaj Auto has its manufacturing facilities at places like Chakan near Pune & Waluj on the outskirts of Aurangabad in Maharashtra and Pant Nagar in Uttarakhand. While addressing members of IMA, Bajaj said that the central government has yet not given nod to his company to launch its quadricycle in India. The low-speed four-wheeler passenger carrier awaits approval of a government draft notification that includes technical specification and regulatory standards for the quadricycle. The draft, which was open for scrutiny by various automakers and stakeholders, closes on Thursday. In a word of advice, Bajaj asked the industrialists to focus on innovation. Bhopal Management Association AGM Held. Bharat Patel & his team reelected. 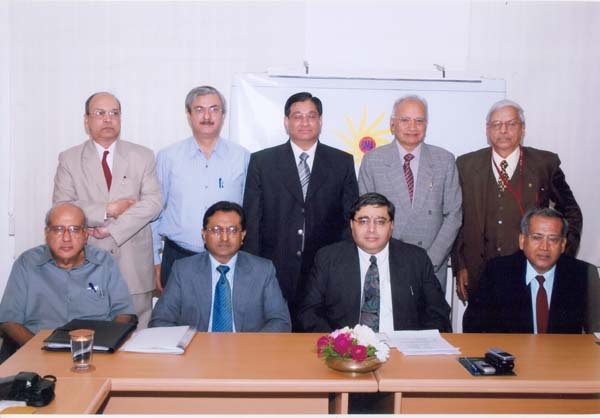 BMA'S 1st AGM was held on 16th June 2007 at hotel Palash Residency.Sh. CE Fernandes, Co-Chairman BMA and noted Industrialist delivered the welcome address and sh. PP Khare, Secretary presented the Annual report. sh. Kanti Gandhi Treasurer, Presented the a/c of the BMA.sh. S. Harsh Suhalka Joint Secretary, presented the vote of thanks. Members present on the occasion reposed their faith in the 1st executive body and unanimously re-elected the same team. Dr. VK Kapoor, Director Peoples Inst. of Management and shri Sanjeev Agrawal of the Sagar Group of Institutes were inducted in the executive body under the institutional category. After the AGM, Dr. P B Sharma, VC of the RGPV delivered presentation on the 21st century challanges before the leaders. He stressed that leaders should have vision and should be able to lead by example. He quoted that India Needs many more leaders like Dhirubhai Amabani, Narayan Murthy, Ajim Premji, Adi Shankaracharya, Ratan TATA, and Vivekanand. Dr. Sharma also answered the questions raised by the members of the BMA, Professionals, Industrialists and the students present on this occasion. Dr. Sharma was also made the hounorary member of the BMA and he was also presented the Shawl and Shriphal for his outstanding contribution towards the Academic and Technology areas. In today's rapidly changing environment the need is to improve, impose and inculcate the best practice and ethical values in all professional activity. The professional managers need to constantly evaluate his strength and weakness, his career options, vis-à-vis opportunities available both from worldly view of success as well as personal view of success. The city of Bhopal is blessed with many engineering colleges, management departments, different types of industries and government departments. But there is no professional association, which can bring the management professionals to a common platform not only to inspire excellence in management education but also to spring board the practicing and potential managers to balance their corporate and social objectives. To fill up this gap a group of professional of the city took up the initiative to from Bhopal Management Association (BMA).
" The city of Bhopal to be a leader in management development movement in the country"
" To facilitate individuals organization realizing their potential"
To promote and develop education of management and related subjects in the city of Bhopal, professionalism in the discipline of management and to provide a good interactive platform to identify skills, pitfalls and opportunities that the management professional face in practical life. 1. Discussion forums, expert lecture, research seminars, conference, workshop, training programs, video presentation etc. 2. Collaboration of other educational, research institute/organization dealing with management as discipline and other management association and organization with similar objective. 3. Establishment of library, publishing journal in the field of management, starting news letter and magazines etc. 1. President - Shri Bharat Patel - CMD, Sandhya Prakash ltd.
2. Vice President- Shri C. E. Fernandes- CMD, GEI hamon industries. 3. Vice President- Shri Prakash Ramani- CMD, Top & Town. 4. 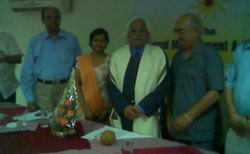 Vice President- Prof. D. K. Bandopadhyay- Director IIFM. 5. Hon. Secretary- Shri P.P. khare- Retd. CGMT BSNL. 6. Jt. Secretary- Shri S Harsh Suhalka- Management Consultant. 7. Treasure- Shri Kanti Gandhi, Chartered Accountant and Financial Consultant. 1. Shri Subash Vithaldas. Permali Wallace. 2. 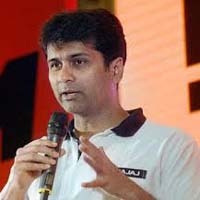 Dr. Niraj Kumar. Ayushman Hospital. 3. Col N. P. Dixit, Chairman, Computer Society of India Bhopal Centre. 4. Shri R. H. Gandhi, Executive, Sandhya Prakash. 5. Shri K. L. Thakral, Oriental Group of Institute. 1. To increase its membership to at least 250 in next two months and ultimately to include all institution, industries dealing with management and management professional of Bhopal. 2. To conduct elections of the executive committee. 3. To establish office of the associations. 4. To start video presentation on topical topics of management. 5. To start lecture series on different aspect of management. 6. To start news letter and magazine.